Kids love Waffles for Breakfast. Crisp waffles, with scrumptious fillings, can make a delicious breakfast if you have a waffle maker. Both sweet and savoury waffles can be made, like Chick Pea and Mint Waffles . Have these sumptuous Breakfast Waffles hot off the waffle iron, for the best texture and flavour. Crispy rava waffles topped with corn, cheese and tomatoes. A tongue tickling snack. Add the fruit salt just before you are ready to cook the waffles. 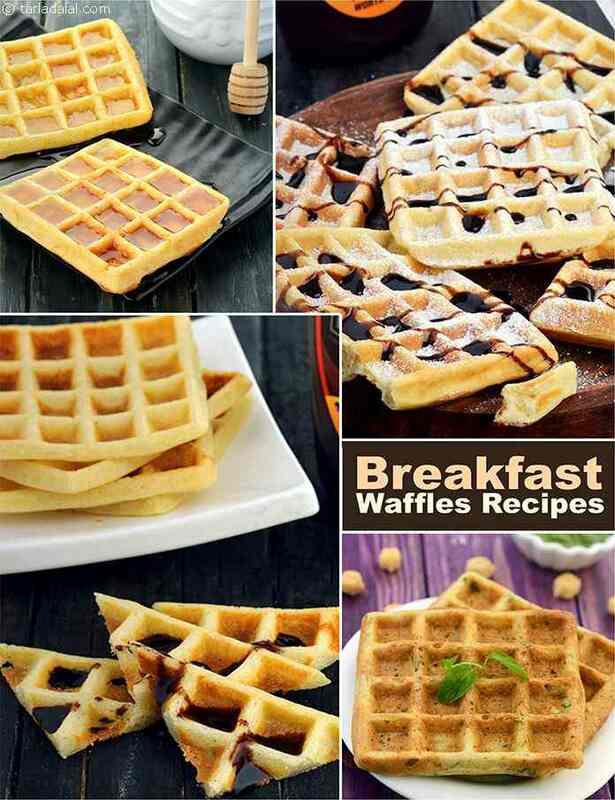 Eat these waffles as soon as they are made! A desi version of crisp waffles, made using moong dal and spices. Tasty batter based breakfast cooked in a waffle iron. Serve these hot waffles with ice cream or honey.